If you’re still troubleshooting the issue, check the DC side of your system. For a microinverter system, you want to be sure each inverter is reporting at its minimal operating range (such as 16V) incoming DC from the panel. Next, check your AC output. 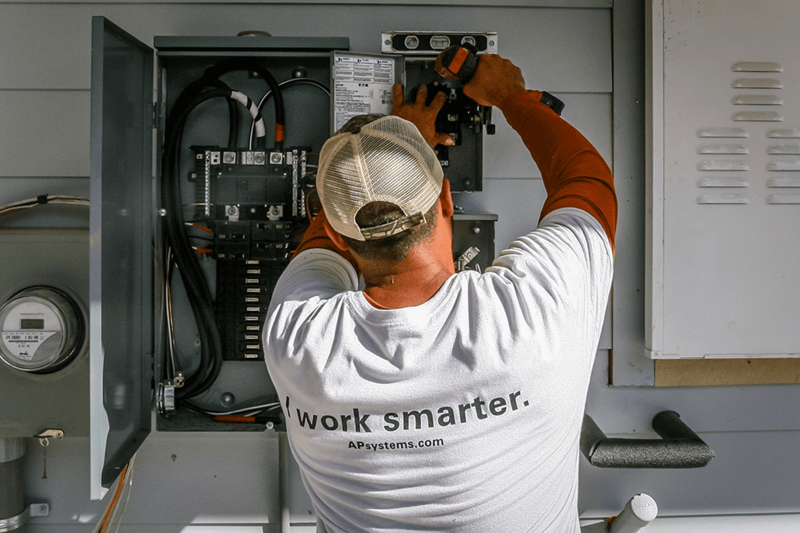 If your system shows it registering 0V or 120V, the inverter may not be sensing the grid or enough volts from the grid to register as a 240V grid connection. 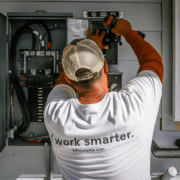 Without an identified grid connection, the inverter will not convert energy, so if you see this as an issue with multiple sequential inverters, it could be a cable or connector problem. If it applies to the entire string or array, the problem could be a loose wire in the junction box, or a tripped or off breaker. 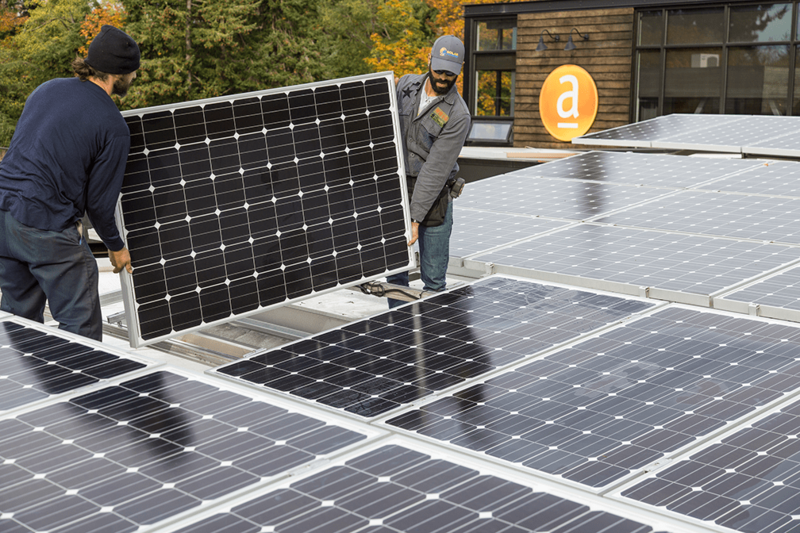 You’re a solar installer not “the IT guy,” so why spend time dealing with connectivity issues, rebooting customers’ Wi-Fi networks? 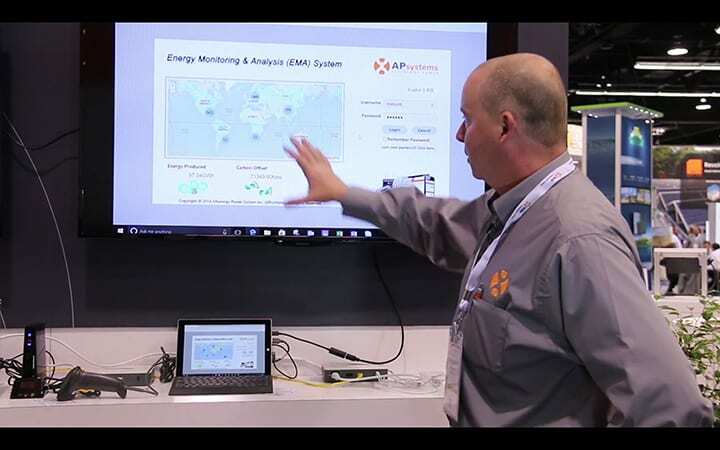 Real-time monitoring is an essential feature of today’s PV systems, but communication between system monitoring devices and the customer’s router is often overlooked. 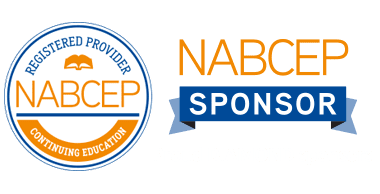 Do you know best options and best practices? 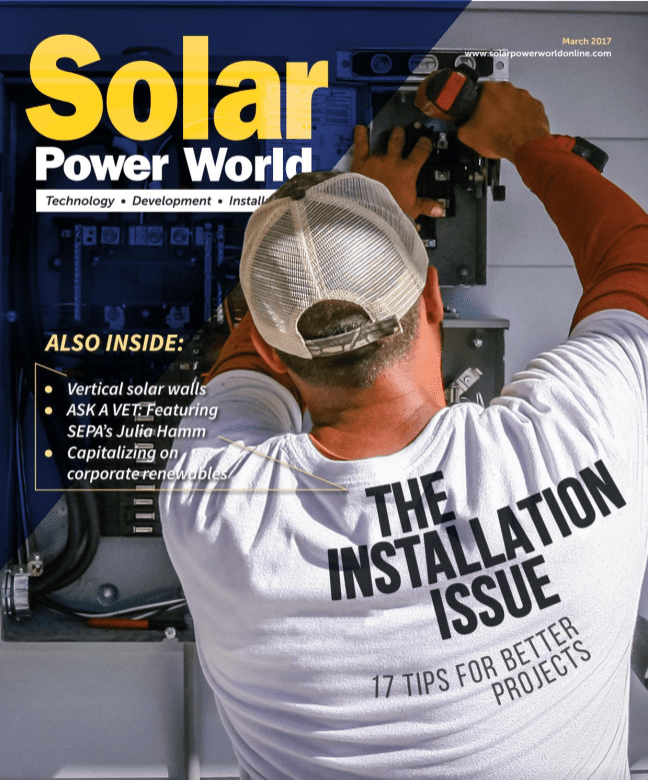 Christopher Barrett, Director of Techincal Services for APsystems, guides installers through the maze of options and issues for gateway connectivity in “The Installation Issue,” a special publication of Solar Power World on newsstands now. 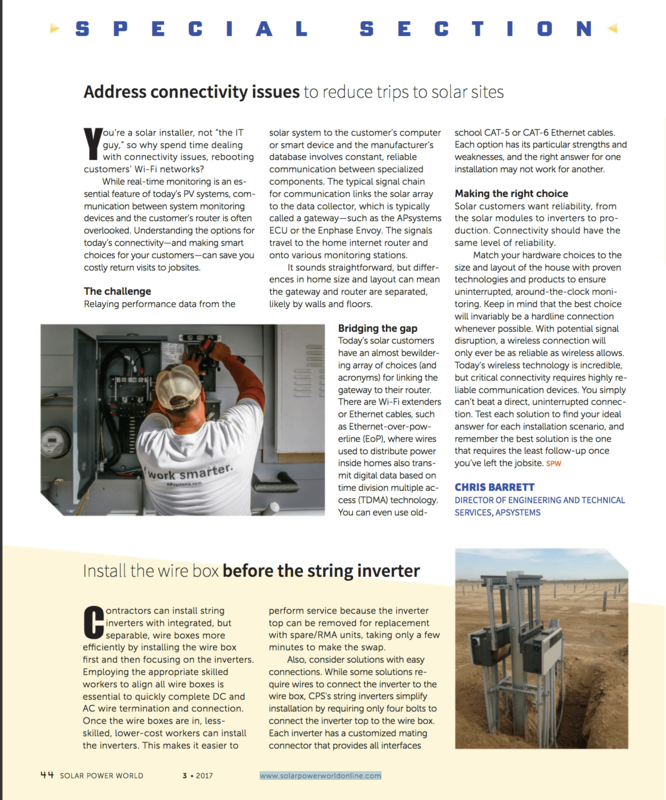 Read “Address Connectivity Issues to Reduce Trips to Solar Sites” online here. 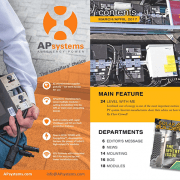 Solar Builder Magazine’s special Inverter Issue is out now, and APsystems is featured throughout. 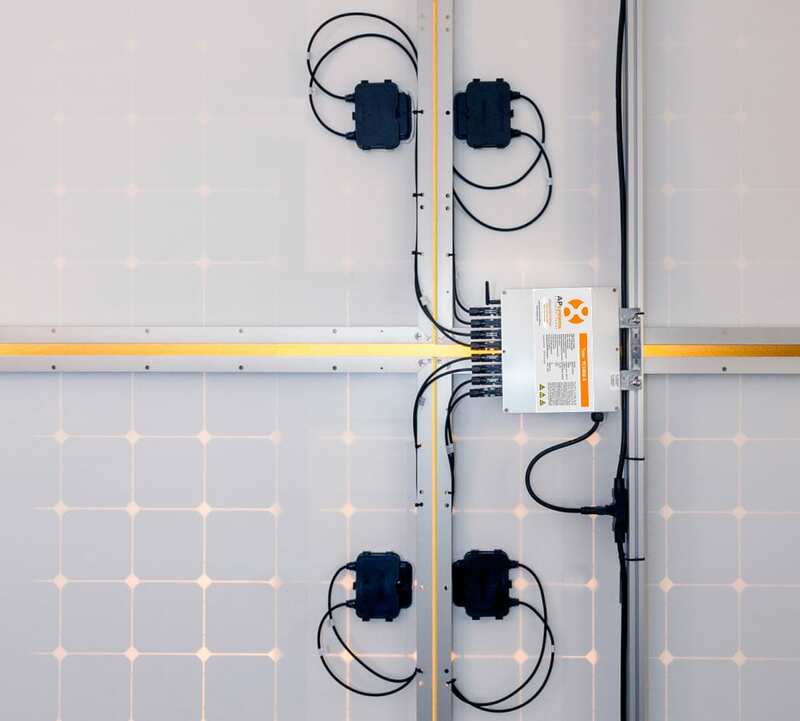 Always follow best practices to head off gateway communication issues, says Christopher Barrett, APsystems Director of Technical Services, in the “Ask An Expert” feature compiled by Solar Builder editors. 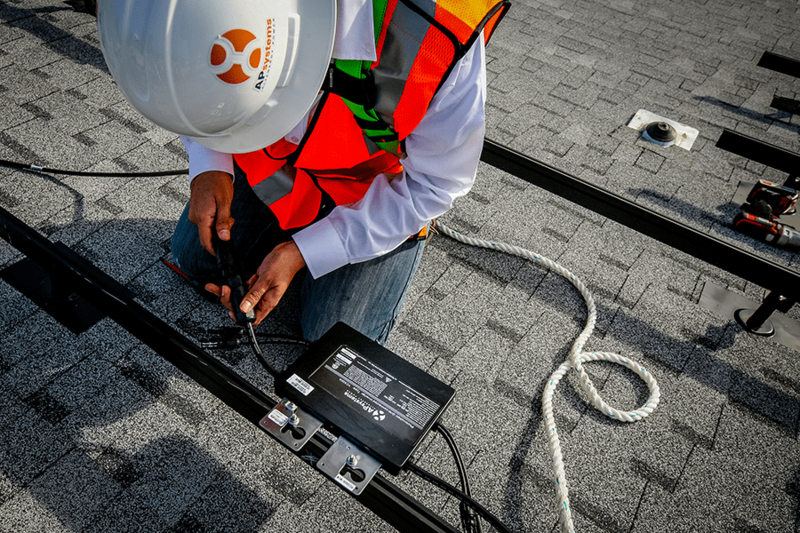 Even in a “wireless” world, hard-wired CAT-5 connections can be the best and most reliable option, Christopher says – and save you the time and trouble of returning to the jobsite to sort out Wi-Fi problems. Remember to compare warranties when doing your calculations – there’s real value in that certificate, should a system component ever need to be replaced. That’s one of the insights APsystems contributes to an informative story on Levelized Cost of Energy (LCOE), the formula that determines a solar array’s investment value over its lifetime. Power and versatility are the hallmarks of the new APsystems YC500i with EnergyMax, a microinverter designed and built for today’s high-output modules, profiled in Solar Builder’s 2017 Inverter Buyers Guide. 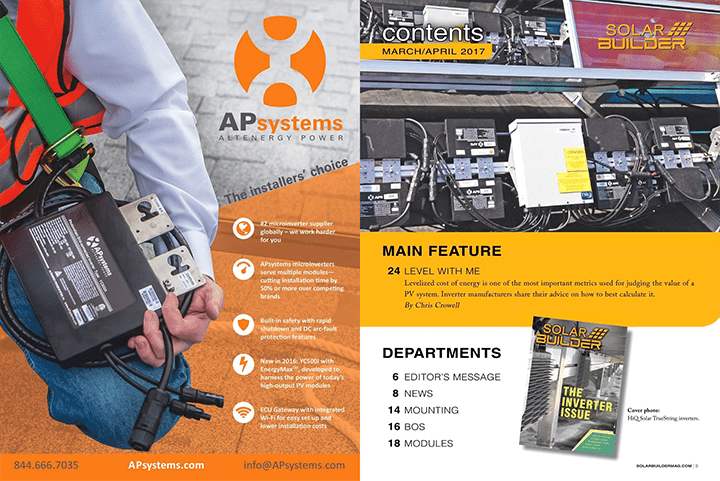 Find out more about APsystems microinverters, “The Installers’ Choice,” on the inside front cover of the edition, on newsstands now. 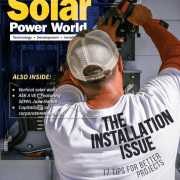 Download the digital edition of Solar Builder’s Inverter Issue here. 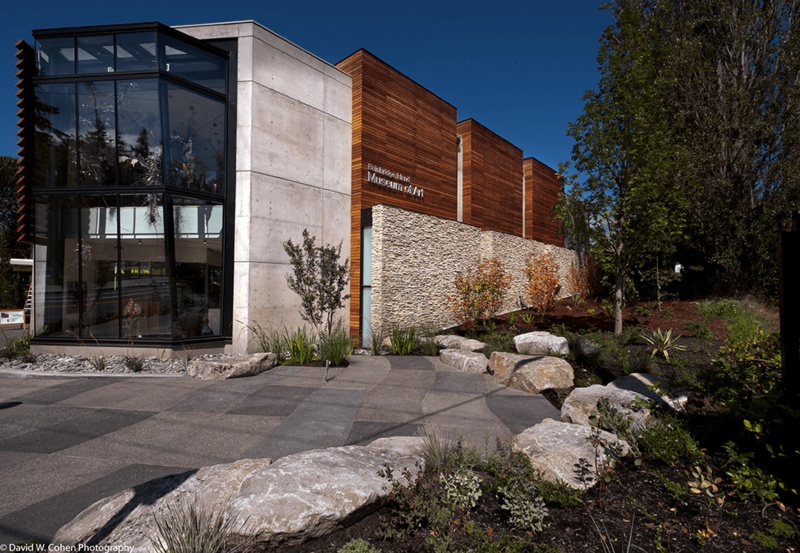 Bainbridge Island Museum of Art near Seattle has earned the vaunted LEED Gold environmental certification, making it the first new art museum in Washington state to achieve the Gold rating. The certification is thanks to a newly expanded solar array using APsystems YC500 dual-module microinverters. 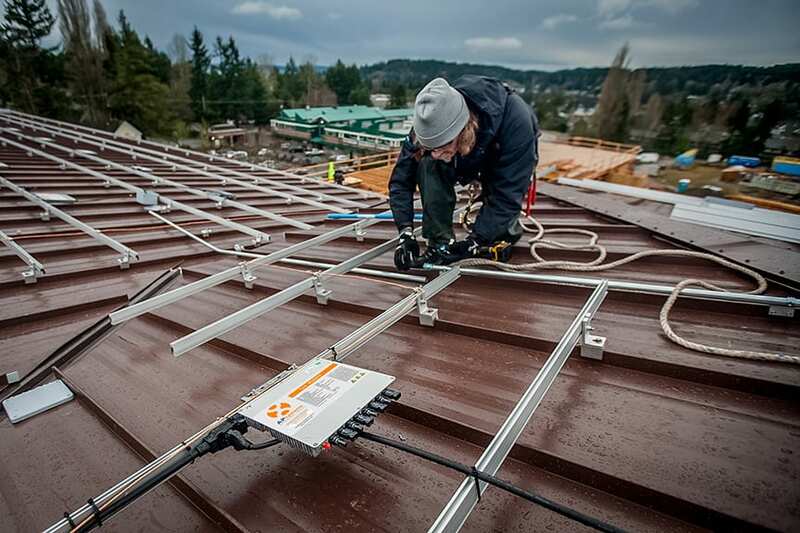 The array uses APsystems YC500 microinverters provided by Blue Frog Solar, and iTek Energy 240W and 280W modules. The inverters were provided free of charge by Blue Frog Solar, Northwest distributor for APsytems USA. Time is money. We’ve all heard the age-old adage, but if you’re a solar installation company, it absolutely rings true: time is your worst enemy. 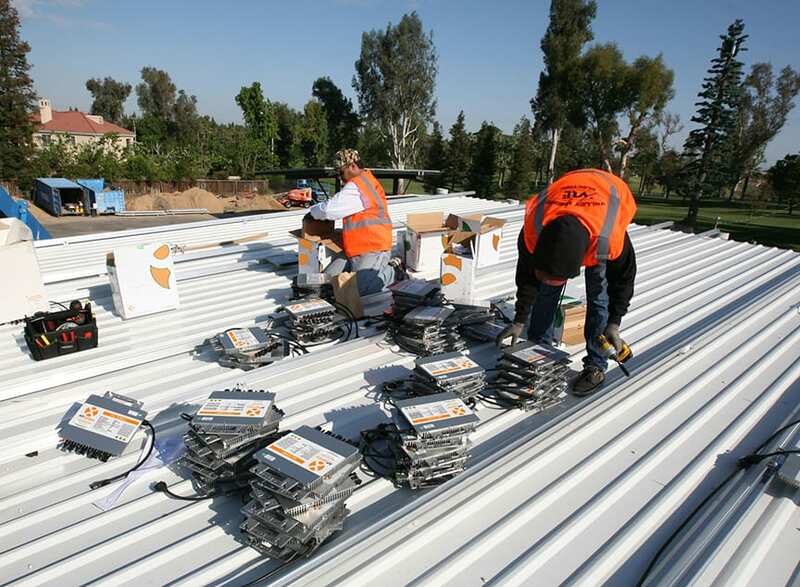 Labor is expensive, so the longer a project takes, the more it costs an installer to put in a solar system, and it comes right out of their bottom line. 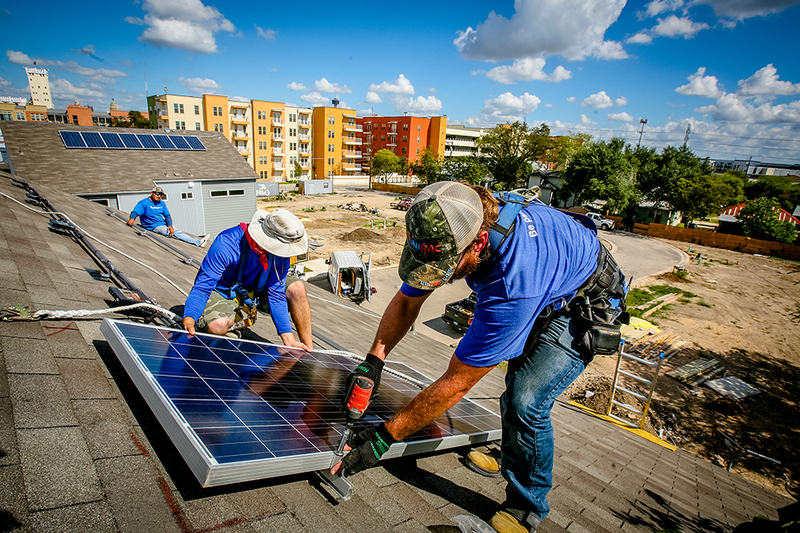 Non-hardware costs such as installation labor, permitting fees and interconnection costs are referred to as “soft costs.” According to the U.S. Department of Energy, these soft or “plug-in” costs of solar account for as much as 64% of the total cost of a new solar system, and labor is one of the largest culprits. 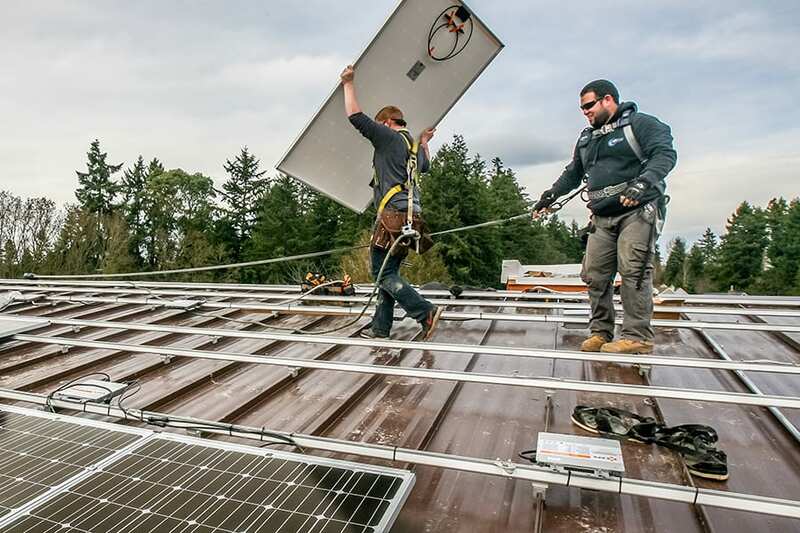 It’s no surprise that solar installers are looking for ways to reduce these costs, and any tool or trick they can employ to speed a project along may just give them the edge they need to not only survive in this highly competitive industry, but to thrive. 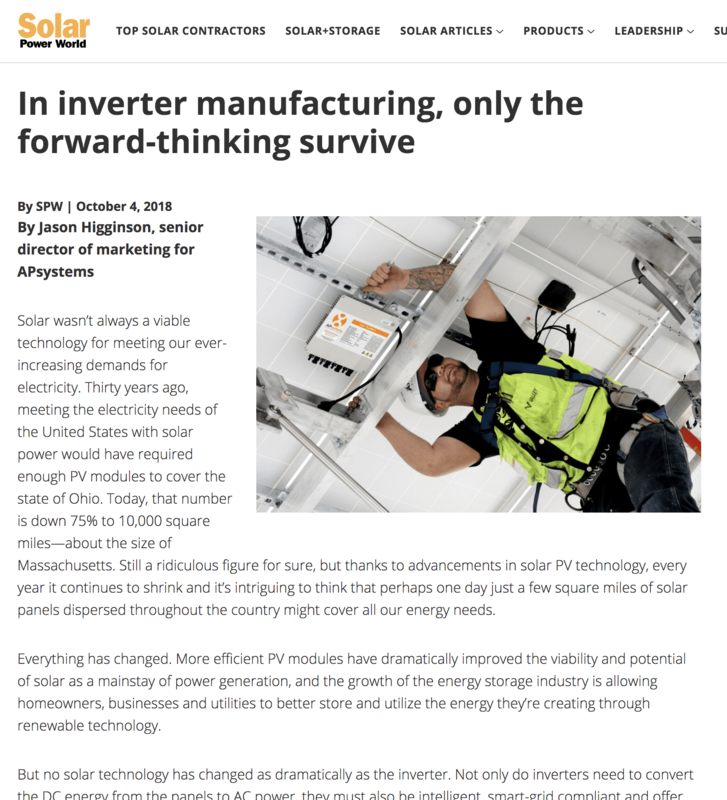 One challenge in this effort to reduce labor costs, is the growth in utilization of module-level power electronics (MLPEs) such as microinverters and DC optimizers. 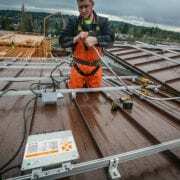 Unlike string inverters which, for residential applications, typically mean a single string inverter is serving all the PV modules on the roof, each MLPE is typically serving a single module. Although an MLPE solar system is often more expensive in initial capital costs and more labor-intensive to install compared with string inverters, it also has a better levelized cost of energy (LCOE) over string inverters as MLPE systems produce more energy over the life of system. It makes sense, then, why MLPE systems comprised 62% of the U.S. residential solar market in 2015, according to GTM Research, and the market isn’t done there as MLPE is predicted to be the fastest-growing product segment over the next five years. 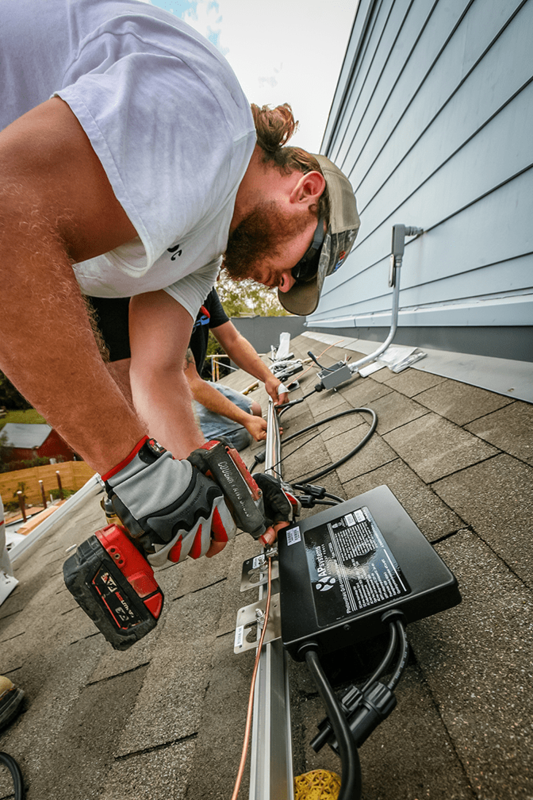 Installers are feeling the time crunch and the challenge today is even greater to take a high-demand yet labor-intensive product and still perform a profitable installation. 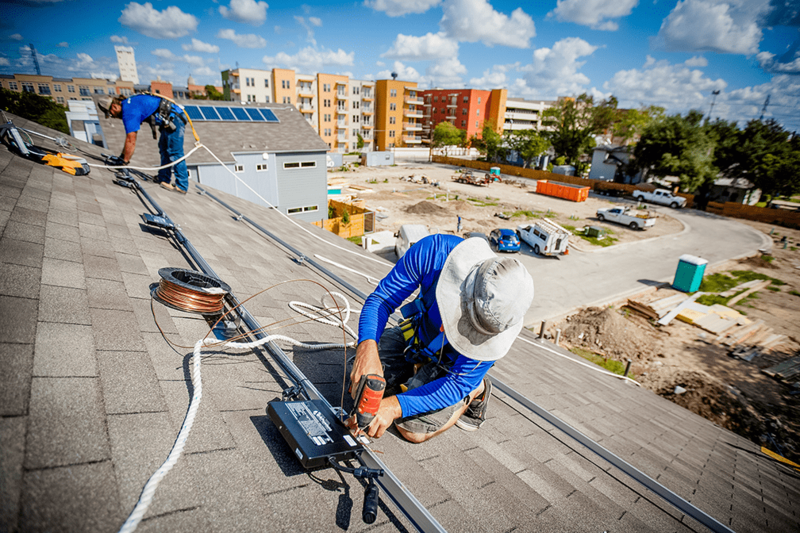 Let’s take a look at a few ways to streamline the MLPE installation process with some serious solar hacks. Microinverters which serve multiple modules exist today and with 2-to-1 and even 4-to-1 module to microinverter options available, homeowners can still get the benefits of an MLPE systems with independent MPPT per module, while installers cleverly reduce the amount of units they’re having to put on the roof by 50% to 75%. Most MLPE systems utilize a trunk bus cable to which installers then attach every microinverter. Not only are trunk cables an expensive part of the system, but placing it on the roof and securing the cable to the racking takes time. Products, such as the APsystems YC500A, utilize a daisy-chain method of cabling and do away with the trunk cable. 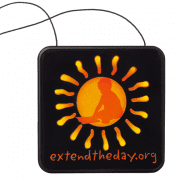 What’s more, the daisy chain is pre-integrated into the unit so it comes completely pre-cabled and ready to go. 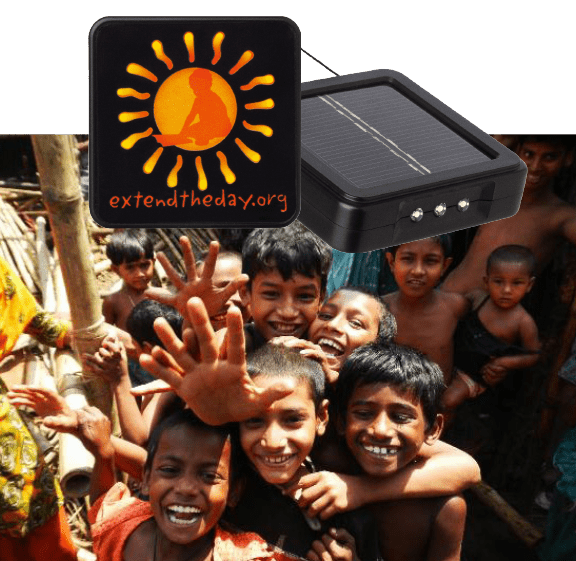 Most solar equipment manufacturers offer free training webinars and videos on their products anymore so absolutely take advantage of this. Don’t miss out on the time (and money) saving tips you can pick up in a short training course or online video series. The gateway communication unit for microinverter installations can be a breeze if installers follow a few simple tips for commissioning the system. Connect the gateway to the internet via a standard Ethernet cable so it can download the most current firmware before you begin to commission the system. 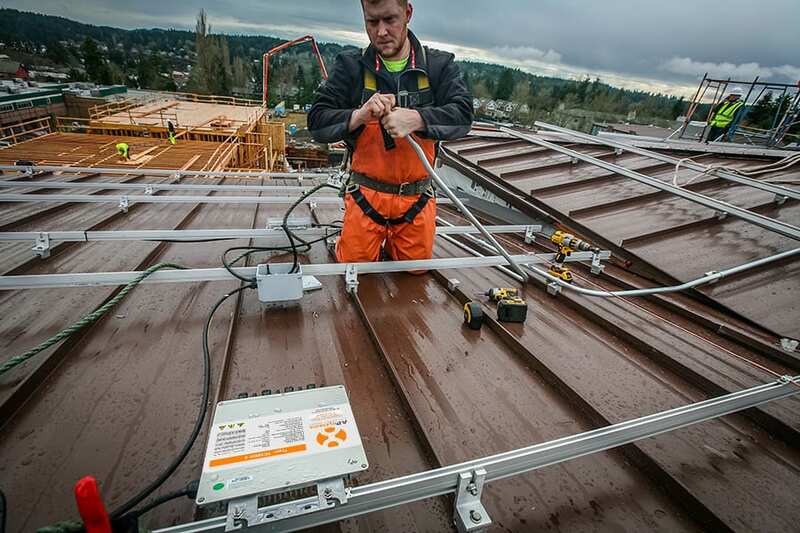 Ideally, you’ll want to do this after the inverter installation but before module installation so the unit can update while your team puts panels on the roof so you don’t lose time. Be sure to connect cables in the right order as some gateways may take longer if power is applied before the network cable (unless the system will be connected via Wi-Fi). Obtaining the homeowner’s Wi-Fi network information and password before hitting the jobsite will also save you time in connecting the gateway. There are some amazing apps out there for solar installers that can help installers streamline system setup. 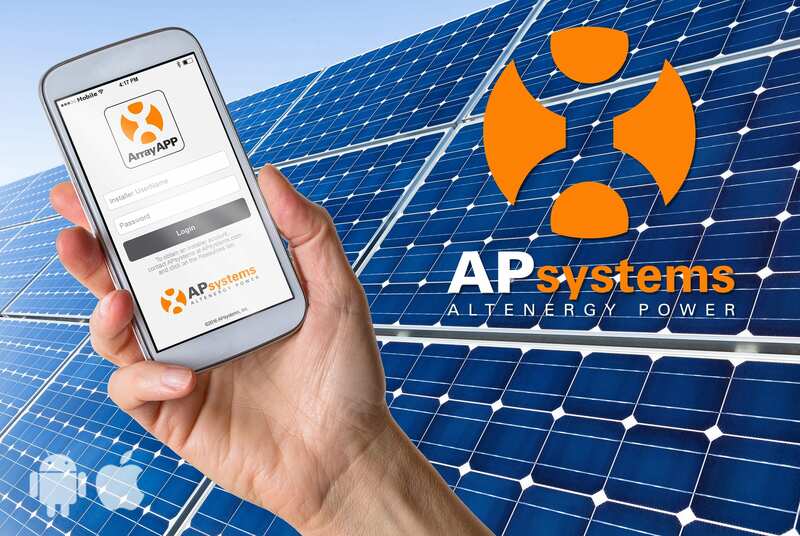 ArrayApp by APsystems, for example, allows installers to create the homeowner account for online monitoring, scan units directly without having to wait for up to 30 minutes for auto-detection of the inverters and create the array site map all from their mobile phone or tablet. Simply search for ArrayApp on your iPhone App Store or Google Play for Android devices. Taking advantage of these time-saving measures can save an installer money but also help them get more installations completed in a single day. As the solar industry continues to lean heavily toward MLPE systems, finding ways to install faster and more effectively can mean the difference between a profitable operation and one that struggles to be competitive. 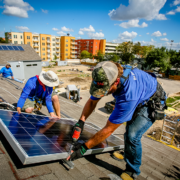 Be sure to do your research, training, find out what other installers are doing and build your own list of valuable solar installation hacks. Asani development company is tackling all three at once at Grow Community on Bainbridge Island, across Puget Sound from Seattle. 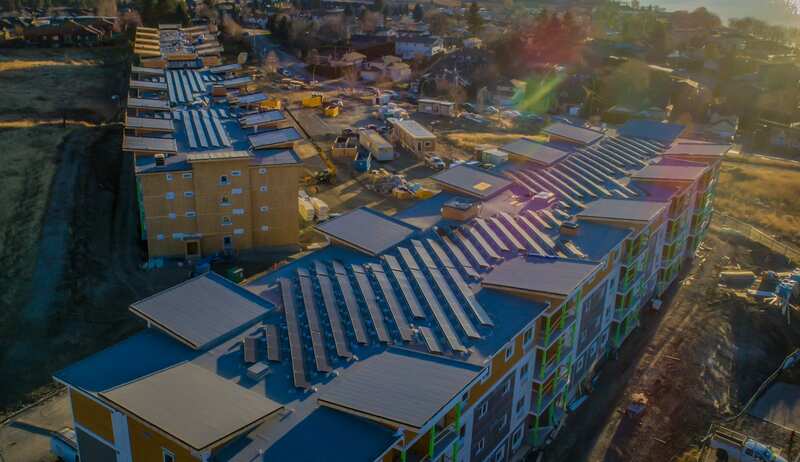 Next door at the 12-unit Juniper apartment building, the 44kW rooftop array is similar but the equation is different. 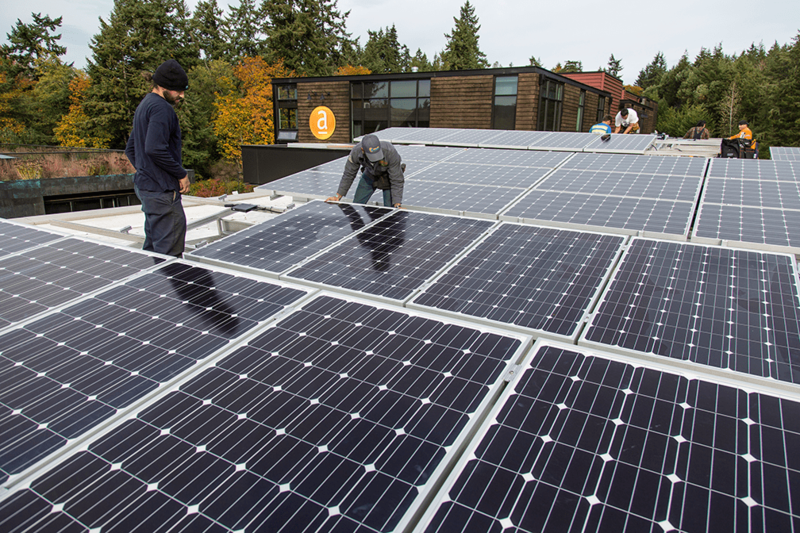 Renters will enjoy the benefits of solar production through net-metering, but not the annual state solar rebate. That will go to the building’s single owner, and will max out at the state’s $5,000 cap. 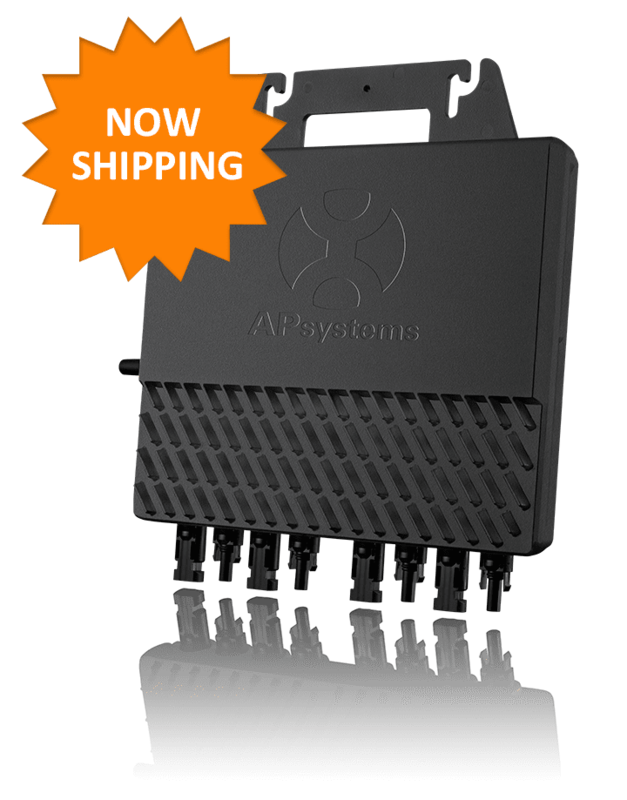 The Juniper building array includes APsystems YC1000 true 3-phase microinverters. 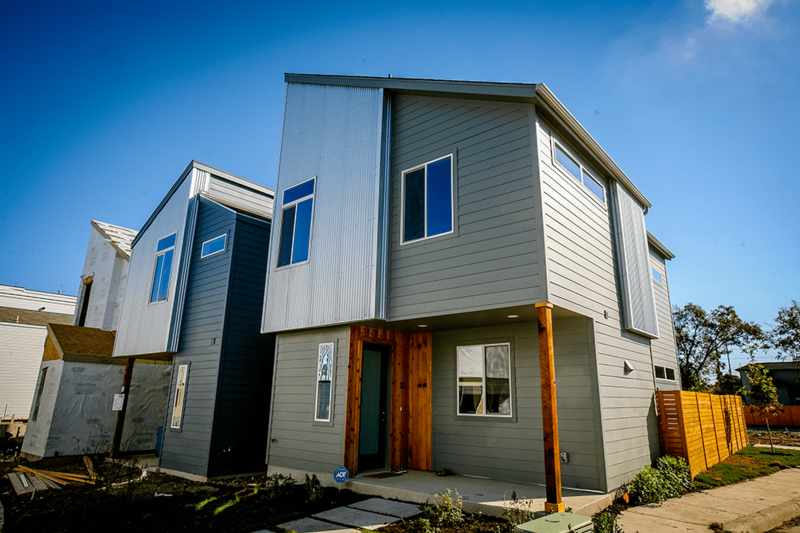 The two-story Elan townhomes presented the most straightforward challenge. 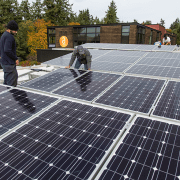 Individual 6-9kW solar packages are offered for each section of the common roof. No modules will cross the “virtual lot lines,” making each system self-contained within the owner’s patch of rooftop. Three systems have been installed so far, including APsystems YC500A microinverters. 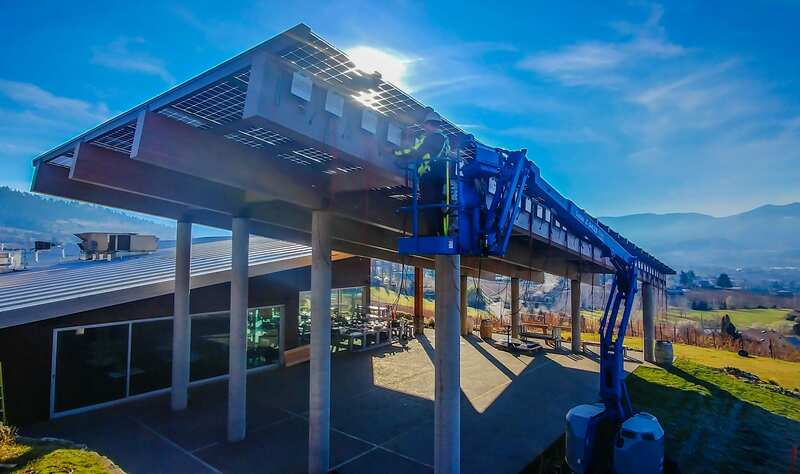 Modules at the Salal are by Itek Energy of Bellingham, WA, while the Juniper and Elan arrays include APsystems microinverters manufactured and distributed by Blue Frog Solar of nearby Poulsbo.